I was familiar with Mauri Kunnas’ work long before. Kunnas is, in fact, the bestselling Finnish author and illustrator. Coincidentally, I worked for the publishing house that locally promoted his children’s books. His skilful art, his fabulous sense of humour and delightful stories turned him quickly into one of my favourite authors. Thanks to Otava Publishing Company, one rainy day I received a splendid gift. When I opened the pack, a rainbow of colours and funny stories burst out. 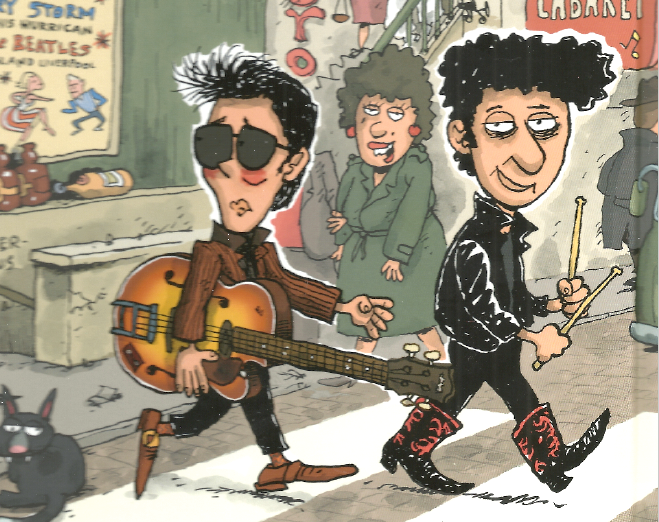 Kunnas’ latest book – “Beatles with an A” – is definitely one of the best Beatles biographies, as far as I’m concerned. Vivid, expressive, exhaustive and, most of all, utterly hilarious, “Beatles with an A” is totally memorable. 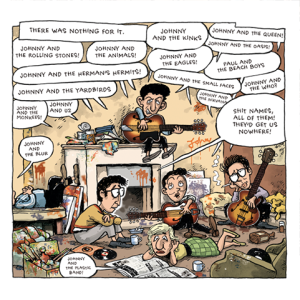 Kunnas’ art of detail is impressive as usual, empowering the bright jokes and the comprehensive research on The Beatles’ lives. “Beatles with an A” is far from being a children’s book. It makes you laugh with tears, sometimes blush and many times be in awe about things you really didn’t know, although you pretend to be a huge Beatles fan. For instance, did you know that Paul’s first instrument was a trumpet or what was, in fact, Strawberry Fields? 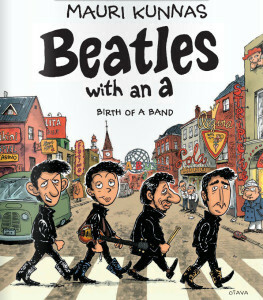 This book is whimsical, eccentric to some extent, but realistically brings to life the early story of The Beatles. 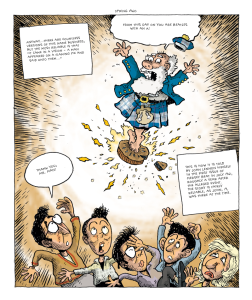 As the author says, it is “like a strip-cartoon album, is not a strip-cartoon but a graphic novel”. Mauri Kunnas has been a fan for 50 years, and his thorough research and love for the band shines throughout the story: “W ithout a doubt, The Beatles were the biggest, most beautiful, and the best band in the world”. 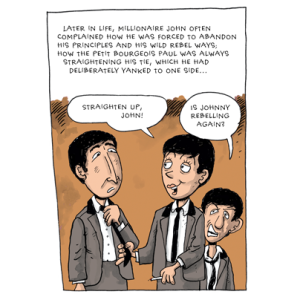 He wrote this “unauthorised biography”, “more or less true”, to celebrate the hugely successful Beatles, who conquered the world by starting the British invasion. He amusingly attributes this story to the “man on the flaming pie” (right), a hilarious character like a Scottish blue Santa who inspired The Beatles on their way to success and reported him the facts down to the tiniest details. With talent and skill, Kunnas plays with every character, making it recognizable and well-defined. 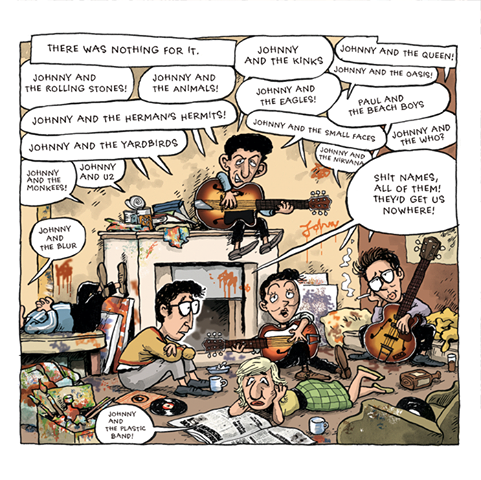 John is the wild rebel, Paul – the petit bourgeois, George – the young enthusiast, Ringo – the apathetic drum prodigy, Pete – the good-looking lad, Stu – the angelic talent, Cynthia – the girl hopelessly in love, Aunt Mimi – the rigid over-protective figure and Brian Epstein – the right man in the right place. The cover itself is a brilliantly suggestive metaphor, as the Fab-Four are on the front cover, while Pete and Stu are left behind on the iconic pedestrian crossing, on the back cover (right). The comic book also presents other successful artists or bands, inspirational for The Beatles or rivals on the Liverpool stage: Elvis, Buddy Holly, Gene Vincent, Little Richard, Cliff Richard, Lonnie Donegan, Gerry and The Pacemakers, Brian Poole and The Tremeloes, Rory Storm and The Hurricanes. The cherry on top are The R olling Stones, depicted as naked cheeky cherubs (left), who sing about The Beatles glory. They often appear on the corners of the pages, marking every climax and revelation on The Beatles’ road to fame. This fancy book has its own website, Facebook page and online version. Enjoy! I sure did!